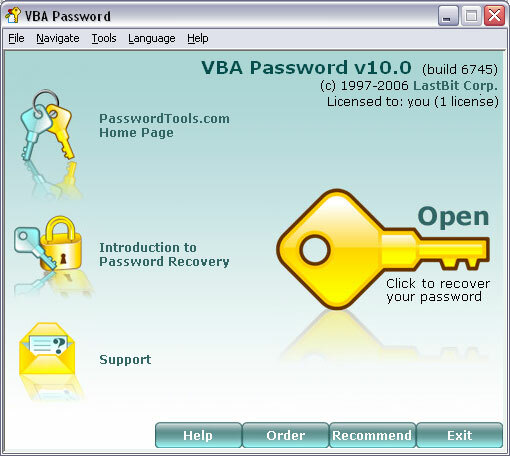 VBA Password Universal utility to recover lost or forgotten passwords to VBA modules. Utility to recover access to password protected VBA modules. The program has two recovery engines: one is designed for Word, Excel and MS Access documents. It supports all Word and Excel versions and Access XP/2003. Another recovery engine allows rectoring access to password-protected VBA modules in any application. Genuine recovery engine is capable of decrypting any password instantly in documents created in Office through version 97. To remove passwords in Office 2000/XP documents brute-force attack is used. It may take too much time. Fortunately there is an alternative way: you can reset a password to known one, so you can get access to VBA project instantly. O Universal utility to recover lost or forgotten passwords to VBA modules. The program has two recovery engines: one is for Word, Excel and MS Access files, another one allows recovering access to password-protected VBA projects in any application. See above information and user's reviews about VBA Password Universal utility to recover lost or forgotten passwords to VBA modules.